I want to live on a street named Candlemaker Row! Greyfriars Bobby is named for the famous dog, and the pub has a fantastic location in Old Town just across George IV Bridge. 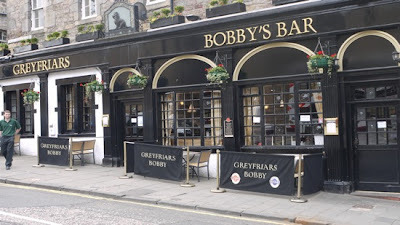 This was my first trip to the Greyfriars Bobby's Bar since we moved to Edinburgh in September, but my third overall. I first visited this pub in 1990 when I was in Scotland for a week as a delegate to the annual International Computer Music Conference. Spread out over three levels, I sat in the corner of the lowest floor and worked out whether or not I wanted to buy the Roxy Theatre back home. The music was horrible (pitch-corrected, lyrically vapid hip-hop), but failed to ruin the experience for me. AW...Greyfriar Bobby! Did you happen to catch a glimpse of the ghostly little guy after a few beers? And yes, you should buy the Roxy.